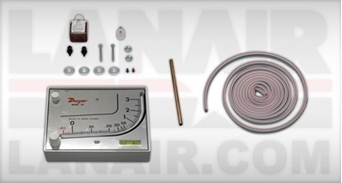 The Manometer is used to adjust the barometric damper for proper draft. For all models. 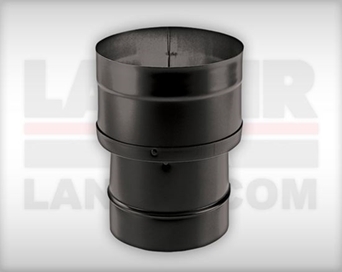 Black Pipe increaser used on Model MXB Boilers Only. 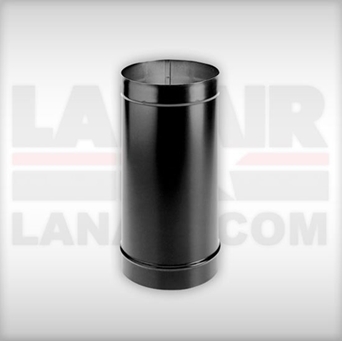 Insulated Chimney 12" L X 6" Dia. With SS inner liner Galvalume outer casing. Comatible with DuraVent brand only. 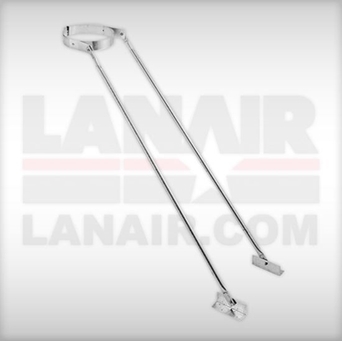 Insulated Chimney 15° Elbow X 6" Dia. With SS inner liner Galvalume outer casing. Comatible with DuraVent brand only. Includes 2 elbows and 1 elbow strap. 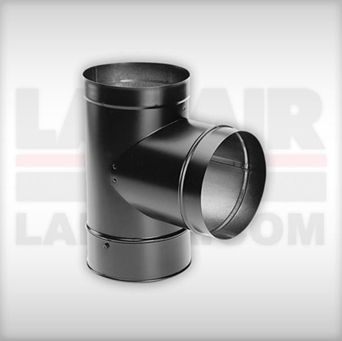 Insulated Chimney 30° Elbow X 6" Dia. With SS inner liner Galvalume outer casing. Comatible with DuraVent brand only. Includes 2 elbows and 1 elbow strap. 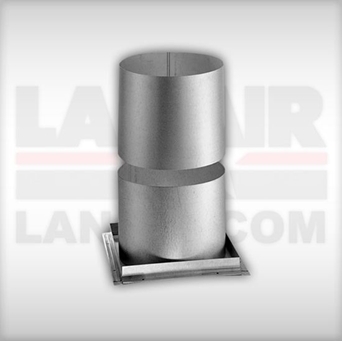 Insulated Chimney 6" L X 8" Dia. With SS inner liner Galvalume outer casing. Comatible with DuraVent brand only. 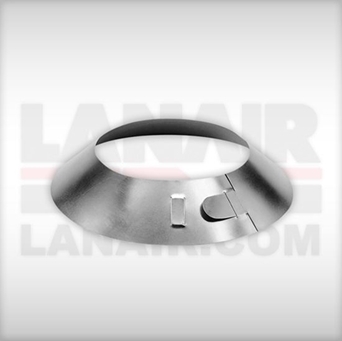 Insulated Chimney 12" L X 8" Dia. With SS inner liner Galvalume outer casing. Comatible with DuraVent brand only. 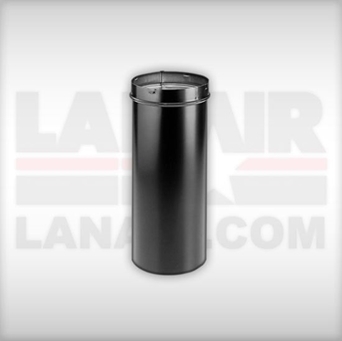 Insulated Chimney 36" L X 8" Dia. With SS inner liner Galvalume outer casing. Comatible with DuraVent brand only. 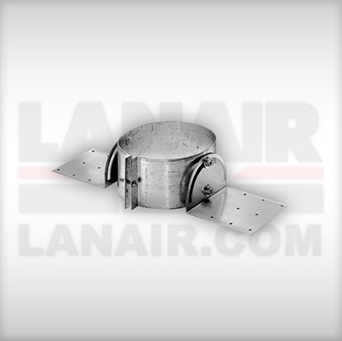 Insulated Chimney 30° Elbow X 8" Dia. With SS inner liner Galvalume outer casing. Comatible with DuraVent brand only. Includes 2 elbows and 1 elbow strap. 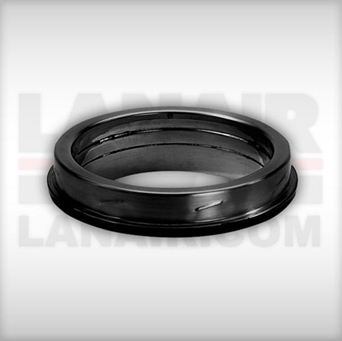 Required for installations that pass through an an attic to prevent insulation and debris from accumulating near the chimney. Fits over Firestop Radiation sheild or a support box. Consists of two pieces - a collar and a base. Adjustable lengths. 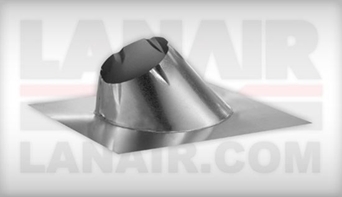 Use in interior or exterior installations to add lateral support to the chimney. Assures a 2” clearance to combustible walls. Required every 4’. Required where pipe terminates above the roof line. 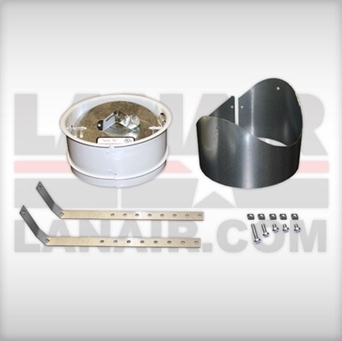 Removable screws allow for cleaning of the chimney and spark arrestor screen. Made of stainless steel. 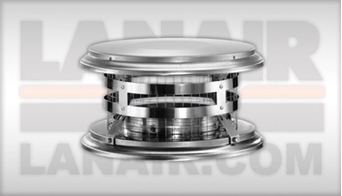 Designed to support the DuraTech Chimney and allows the chimney to pass through the roof and extend down from the ceiling. 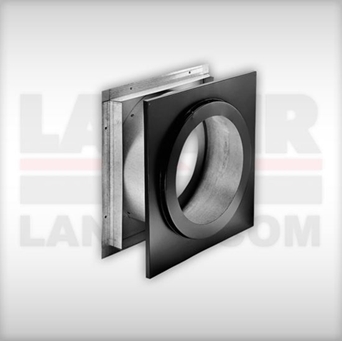 Ideal for cathedral ceilings and free-standing fireplace installations. 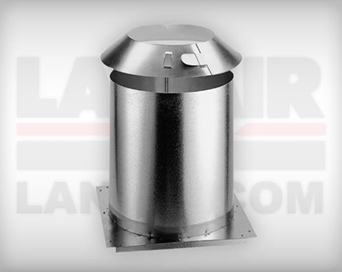 Supports up to a maximum total chimney length of 45' above and 20' chimney below Roof Support. Adjustable to different roof pitches. 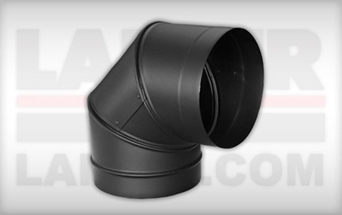 Integrated collar with adapter, fits into the female end of the chimney pipe to provide a decorative black finish. 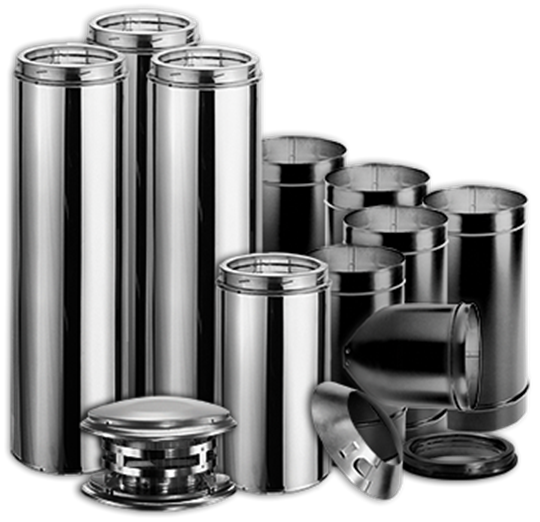 Use on chimney pipe that is suspended with the roof support system or on pipe that is passing through a wall thimble. Provides connection to DuraBlack. Use to support the chimney when it extends more than 5' above the roof. Provides stability to chimney against wind and snow. Mounting brackets and adjustable tubing included. Use to weather proof the penetration of chimney pipe through the roof. Storm Collar required. Select roof flashing based on pitch of roof. Black Pipe 12" L X 6" Dia. For Indoor use only. Requires 18" clearance to a combustible. 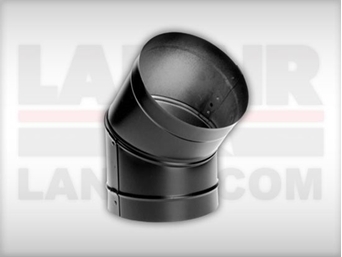 Use to adapt DuraBlack pipe to ceiling support box or finishing collar. 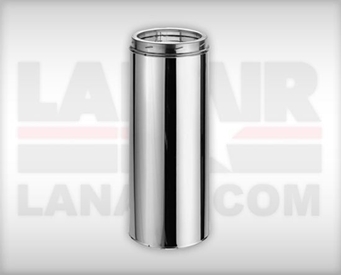 Adds 3” - 13” of length to rigid pipe. 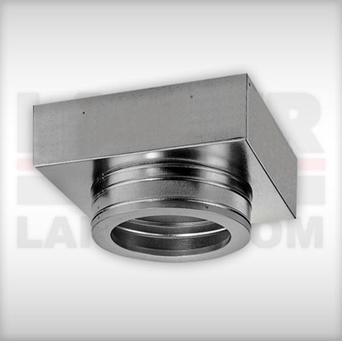 Allows drip-free installation without cutting the pipe. 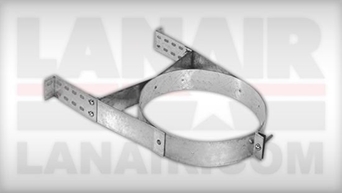 Can be used in line to create a telescoping combination when used with a straight length of pipe. Provides a strong mechanical connection. Used at the bottom of a vertical run for clean out. 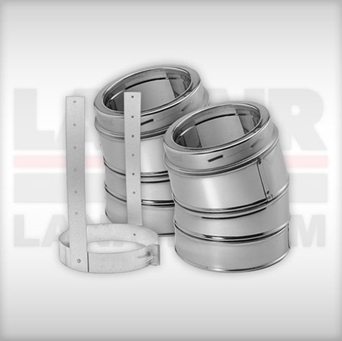 Use to prevent excessive weight on the elbow by supporting the weight of the chimney. Required to be installed between two elbows in offset installation. Black Pipe 24" L X 8" Dia. For Indoor use only. Requires 18" clearance to a combustible. Black Pipe 12" L X 8" Dia. For Indoor use only. Requires 18" clearance to a combustible.